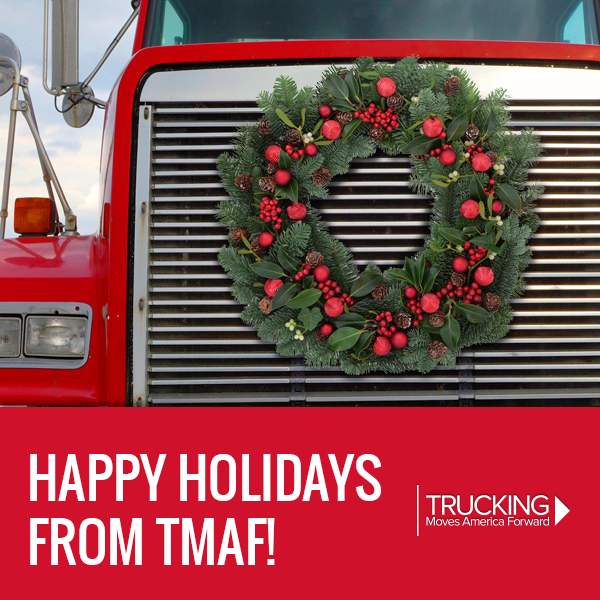 Trucking plays an integral role in making the holiday season special – from stocking store shelves and putting food on the table, to taking part in Wreaths Across America and the lighting of the U.S. Capitol Christmas Tree. Tell us what you or your company have planned, in terms of charitable acts, community events, or other activities that make us proud as an industry to say Trucking Moves the Holidays. Send an email to info@truckingmovesamerica.com (by the Thursday, Dec. 8 deadline), to have your organization included in TMAF’s end-of-year release to industry and media – which will also be featured here on TMAF’s website and on our social media channels. http://truckingmovesamerica.com/wp-content/uploads/TMAF_5YEARS_275x68_RGB.png 0 0 Editorial Staff http://truckingmovesamerica.com/wp-content/uploads/TMAF_5YEARS_275x68_RGB.png Editorial Staff2016-11-22 16:17:112016-11-22 16:17:11Send Us Your Stories! OOIDA’s Trucker For Troops campaign wrapped up its 10th annual fundraiser on Monday, Nov. 14. While the final numbers are still being tallied, it’s safe to say that this year’s fundraising efforts will again help many U.S. troops serving overseas and back in the states. Through the first nine years of the campaign, it has generated more than $505,000 for care packages and other supplies to help U.S. military personnel. With those funds, OOIDA has sent more than 3,000 large care packages and provided items to nearly 36,000 military personnel stationed in war zones. In 2015, the Association expanded the program’s mission to include supplying needed items to various medical care facilities for wounded or needy veterans back in the states. The care packages weigh about 70 pounds each and include enough items to serve an entire unit. The packages can include anything from practical items like soap, toothpaste and snacks to fun items like playing cards, crossword puzzle books and games. During the annual campaign, OOIDA new and renewal memberships are discounted to $35, which is a savings of $10 off the regular membership fee. Ten percent of the membership fees paid during the campaign week go toward the Truckers for Troops fund. OOIDA then matches those funds. Even though the 2016 campaign has ended, individual tax-deductible donations for Truckers For Troops can be made all year by calling 800-444-5791. Earlier this year, American Trucking Associations and ATA’s Share the Road highway safety program launched this Share the Road Instructional Video to demonstrate safe-driving techniques. More info can be found here.